Doug Sitler after the final tree was strung at 2 AM. 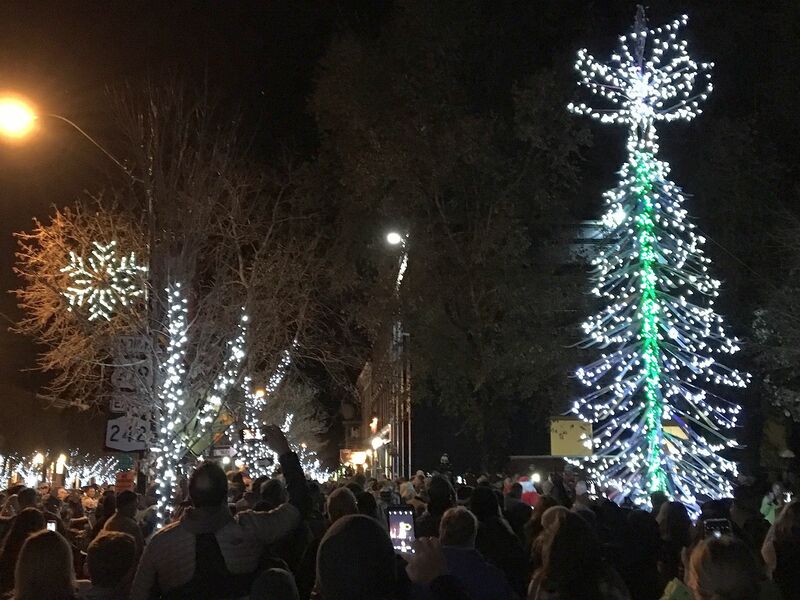 A few weeks ago, the Friday night of the “Christmas in Ellicottville” weekend signaled, not only the debut of the fun “Ski Tree” in front of the 1887 Building, but also the return of the illuminated trees on Washington and Monroe streets in the village. The bright white LED lights are a signal that the long-awaited winter season has returned. The lights will remain illuminated until the end of March. I got involved in lighting the trees in late summer 2016 through my ownership of a small lighting and event company, called NIGHT LIGHTS. For nine years, NIGHT LIGHTS have illuminated several Western New York locations, including Ellicottville’s Nannen Arboretum, Buffalo Botanical Gardens and the nearby Griffis Sculpture Park. 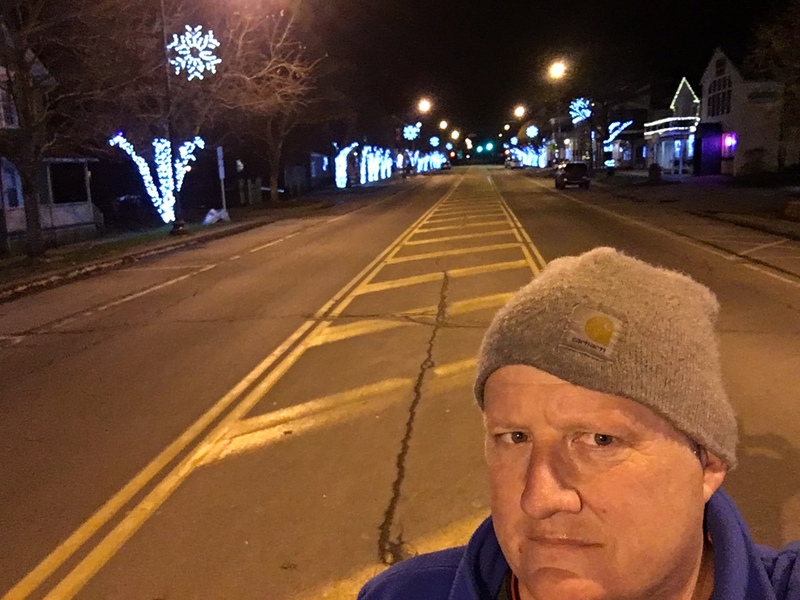 I received a call one day from the enigmatic Brian McFadden, president of Ellicottville Chamber of Commerce about possibly getting involved in enhancing the tree lights for the upcoming holiday season. A few days later, a lunch meeting was held at Dina’s Restaurant, with McFadden, Mayor John Burrell, Greg Cappelli and Jim Carls in attendance. 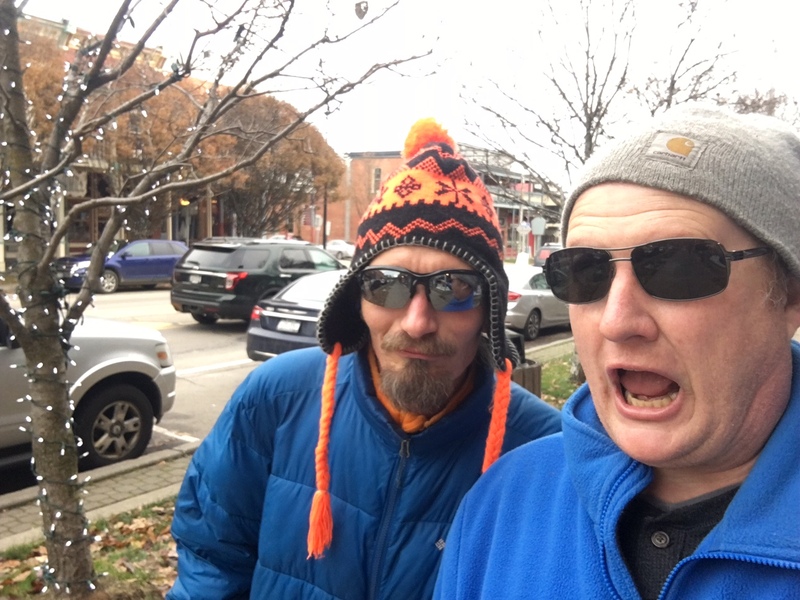 We discussed the possibilities and pitfalls of lighting up downtown. 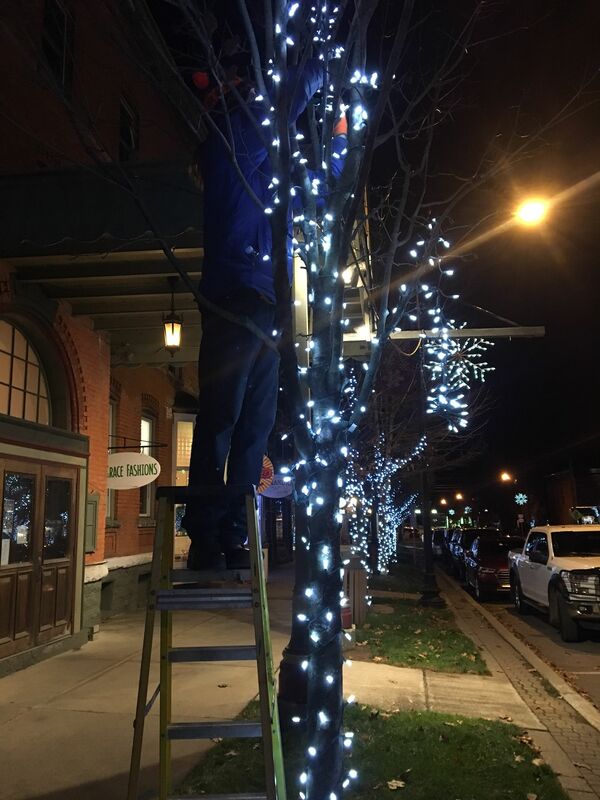 Quickly, McFadden and several Ellicottville business owners privately raised money to fund the installation of lights on 33 trees in the downtown core of the village. One of the many things that impress me about the people of Ellicottville is their “can do” attitude. We had to estimate how many strings of lights we would need, where the power sources are located and much more. Several meetings took place and installation occurred during a warm November 2016. Last winter was wet and soggy, giving the lights a good test. In total, 310 strands of lights were installed. The lights immediately created a festive atmosphere in the village. They shined brightly throughout the winter, eventually going dark at the end of March. The goal is to leave the strings up year-round, removing them every few years to compensate for tree growth and trimming. This year, the mission was to expand the amount of trees that featured lights, including going further down Washington Street towards the banks and Tops. A dozen new trees were added this year, bringing the total up to 45 trees. Most of the trees installed in 2016 received an extra string or two of lights this year, which created a total 450 strings installed in the downtown core…that’s over 1.75 miles of lights shining brightly in the middle of town. You would think that installing some Christmas lights on a tree would be fairly easy, but it does pose it challenges. It usually takes about 45 minutes to one hour to install lights on a single tree. Some trees are full of small branches, making it difficult to wrap 24 foot strands of lights. In reality, some of the smallest trees are the toughest to light up due to their small, delicate branches. We also are very careful working on the trees, doing our best not to damage the branches. In fact, with the exception of an occasional zip tie, there are no foreign objects inserted into the trees – causing further damage. Some trees are 10 feet tall and others span 20 feet, so to keep some uniformity the lights are wrapped up to 14 feet high, otherwise a bucket truck and double the installation hours would be needed. For obvious reasons, we try to weather proof the lights and connections as much as possible to prevent blown fuses and permanent damage. Water is not electricity’s friend. None of the lights would not be illuminated if it wasn’t for the fine work of the town’s DPW. Late each fall they install temporary power lines above the trees, making it possible to light up each tree. If there’s an electrical glitch, the DPW crew gets right to it and fixes the problem. Hat’s off to them! The actual installation of the lights can be tedious, but it can also be somewhat fun. We tend to work at night, so you get to experience visitors coming and going into the town’s dining and cocktail establishments. Many shop owners and residents will stop by and make wonderful comments. 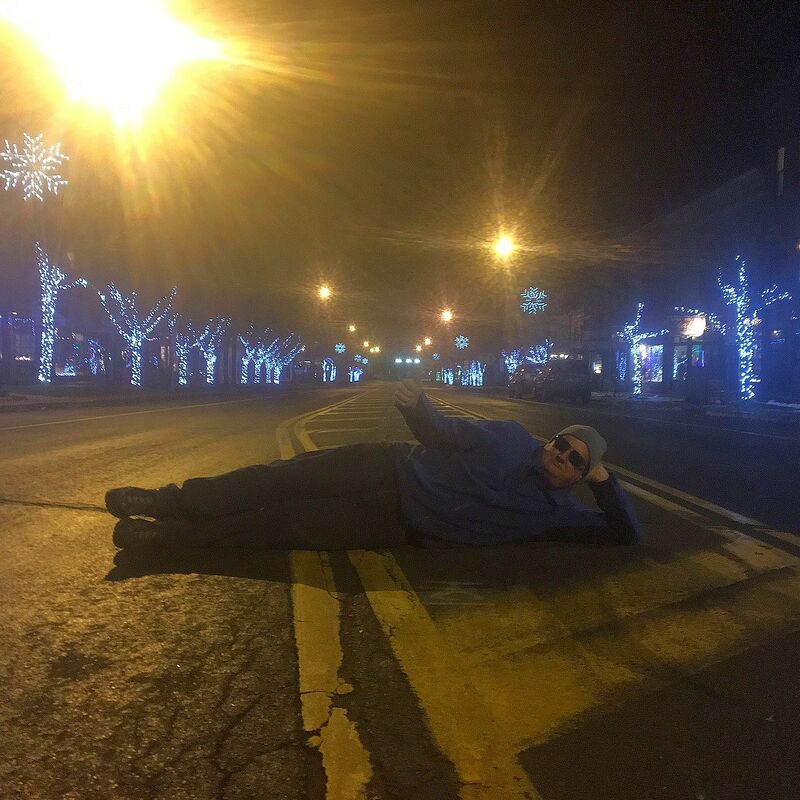 You can tell they take pride in Ellicottville and the lights add to the ambiance of the village. Everyone is so sweet and encouraging. It’s wonderful working for a town that most WNY communities envy. Doug’s Takeaway: Don’t be afraid to hustle. Don’t be afraid to put some crazy hours in for some kind of benefit. Also, if you work with people you like and trust, that’s a good feeling too. The Ski Tree Christmas Celebration in downtown Ellicottville. Town is ready to celebrate the winter season.